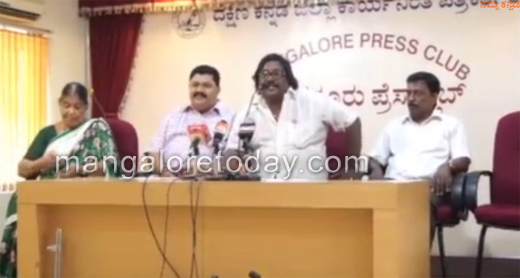 Mangaluru,Aug 23, 2015: Addressing a media conference, Director Sharathchandrakumar Kadri, who also written screenplay, dialogues, literature for the movie, said that Shooting of the ’Bollilu’, a Tulu movie based on the novel ’Durantha Preeti’ by Shashikala Rajashekhar would commence at Sri Manjunatha Temple, Kadri here on August 23. The movie is being produced by Mithra Heraje, Pithambara Heraje, Shakila Sharath and Shashikala Rajashekhar under the banner Sri Mangaladevi Creations. Shravan Kumar and Pratheeksha Poojary will play the lead roles for the first time. Renowned artistes including Suresh Rai, Pithambara Heraje, Vishwanath Pandith, Deepak Rai Pataje would be there among others in star caste. "Many new faces would be introduced through the movie," he said. State award winner Renukumar would work as cameraman for the movie. Music composer late Jitin Shyam had started the work of music composition and Dr Nitin Acharya has continued it. The experience of Gurudatt Pai would help in the direction. Rajesh Brahmavar (dance), M Rangarao (art) and others are in the team, he said. Actors Shravan Kumar, Pratheeksha Poojary, Producer Mithra Heraje and others were present.